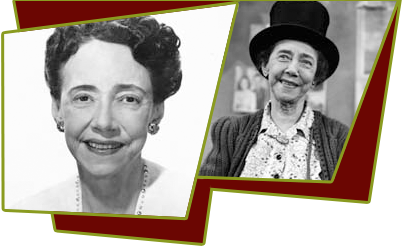 Elizabeth ("Patty") Patterson was born in Savannah, Tennessee on November 22, 1875. She was a daughter of a Confederate soldier, E.D. Patterson, who became a judge. In 1926 at the age of 51, she was in her first movie "The Boy Friend". She starred in her next movie 4 years later in 1931 at the age of 56, "The Tarnished Lady". Afterwhich, she was in over 100 movies. Some of the best known movies and actors she worked with was "3 Cheers for Love", 1936 with William Frawley, Irving Bacon, and Bob Cummings; "Her Master's Voice", 1936 with Edward Everett Horton; "Old Hutch", 1936 with James Burke (he was in the I Love Lucy episode, "The Diner"). Other movies include "Small Town Girl" 1936 with Frank Sully (he was in the episode, "The Freezer" on I Love Lucy); "High, Wide and Handsome", 1937 with William Frawley; "Bluebeard's 8th Wife", 1938 with Edward Everett Horton; "Sing You Sinners", 1938 with Fred MacMurray and Irving Bacon and "Sons of the Legion" with William Frawley. In 1939 she starred in "Cat and the Canary" with Bob Hope; "Remember the Night", 1940 with Fred MacMurray; "Tobacco Road", 1941 with Irving Bacon; "My Sister Eileen" (1942) with Frank Sully and in 1944, "Together Again" with Charles Boyer. She starred again in 1945 will William Frawley in "Lady on a Train"; and in 1955 with Kathryn Card (Lucy's Mom on I Love Lucy) and Joseph Kearns (he was in the episode, "The Kleptomaniac" on I Love Lucy) in the movie "Daddy Long Legs". In her next to the last movie in 1959, "The Oregon Trail" she starred with Fred MacMurray. Her last film was in 1960, "Tall Story". Having guest-starred in "The Marriage License" episode of I Love Lucy, playing the role of Mother Willoughby, wife of the Justice of the Peace and lady Mayor, she was tapped to play the lovable neighbor, Mrs. Mathilda Trumball from 1953-1956. She was 78 years old at the time. Never married, she lived alone at the Hollywood Roosevelt Hotel during her thirty-year motion picture career. She died at the age of 91 on January 31, 1966 in Los Angeles of complications from pneumonia. She is buried in her hometown of Savannah, Georgia.